You can’t even cross into the border of Illinois without becoming immediately aware that Lincoln is a pretty big deal here. “Land of Lincoln” is proudly declared from every license plate, while cities and streets claim his name and murals of his liking adorn the side of buildings. As Idahoans I must confess that our knowledge of Abe was sparse at best briefly bolstered by the fact that we had a recent reintroduction in South Dakota upon seeing his likeness carved into Mount Rushmore. We are no longer ignorant. Our hearts and minds are now bursting with a love and deep respect for this man who shouldered more in his lifetime than most can ever imagine. 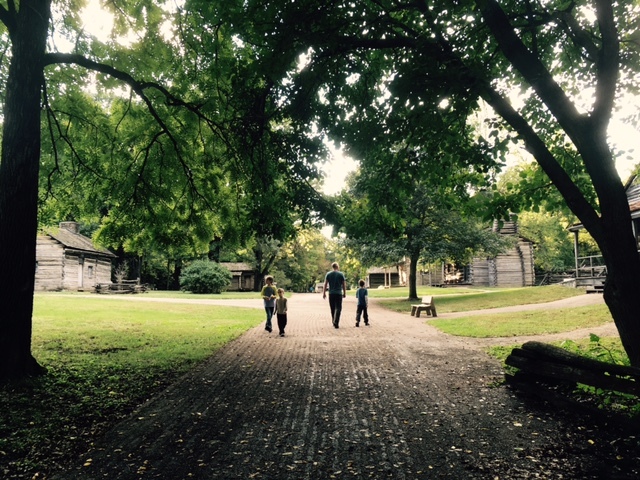 Our visit began in New Salem, Illinois at the state historic site where we strolled the streets of the recreated 1830’s town that Lincoln lived in as a young adult. It was here that we discovered how lye is made, saw the kind of boat Lincoln floated down the Mississippi River in and stood in front of the store he once owned. It was also here that we learned of several early failures that he experienced such as lost elections and failed businesses. I love living examples of perseverance. The peaceful atmosphere as we meandered the streets allowed our minds to wander and imagine what it would have been like to live in that time. I was struck by the fact that women routinely gave birth to 10-12 children and most commonly died of childbirth, infection from a fireplace burn or fatigue (in that order). It was also not uncommon for those who lived outside of town to go years without seeing another woman. How much I take for granted in this time of information, travel and communication. 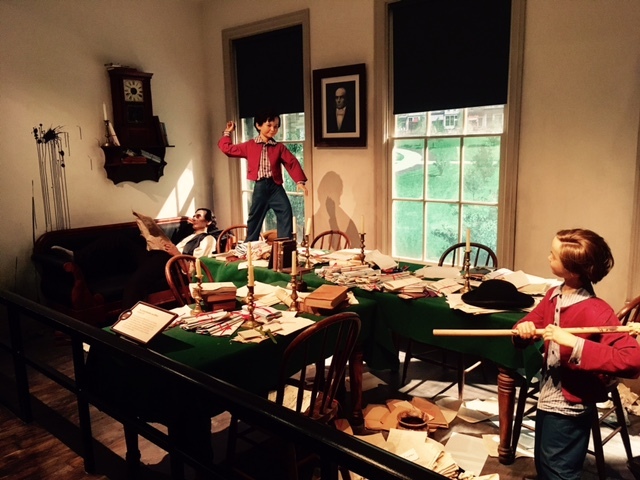 The next day we drove into Springfield where the kids earned their Jr. Ranger badges as we toured the home that Abe and Mary Lincoln lived in before Abe was elected president. The decor replicated what it looked like in 1840’s thanks to photographs that had been taken and many pieces of furniture were originals. 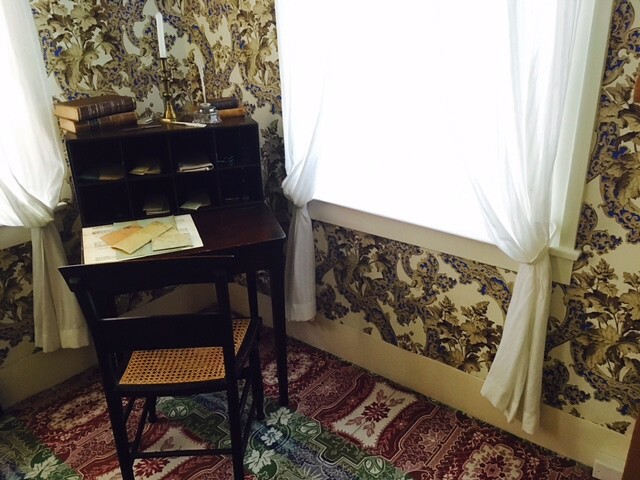 I was amused by the whimsical wallpaper and astonished at the ornate carpets found throughout the home considering the muddy streets that would have been right outside their front door. One story our tour guide told that I especially loved was that of a eleven-year-old girl named Grace Bedell who wrote Mr. Lincoln suggesting that he grow a beard. He took her advice and later met Grace in person and asked how she liked his new look. That afternoon we drove to the site of his tomb where we were able to walk around inside and see the place where he was buried next to his wife and three of his sons (two of which died before his assassination). His fourth son is buried in the Arlington Cemetery. The following day we returned to Springfield and spent over four hours at the Lincoln Presidential Museum. The caliber of interactive displays was astounding and the two hologram movies that they showed truly amazed us (some of us even opted to watch one of them a second time). A highlight was seeing one of the three remaining hats that Lincoln owned on display. The brim was worn thin in two distinct places where his fingers gripped it to tip to passers by and the inner band was stretched (mostly likely from storing speeches and notes inside). Many things were new to me as we toured the museum. I was shocked to learn that Lincoln let his kids run amuck playing games with the ink wells and stacking books into towers before playing atop them while he sat idly by. Outside of the White House, I never realized the amount of mixed support and outright opposition that Abe was up against during his time in office especially from the media. Most felt he was either not doing enough to end slavery or pushing the issue of emancipation too far, too fast. It was not until after his assassination that people truly came together in support and admiration of his leadership. 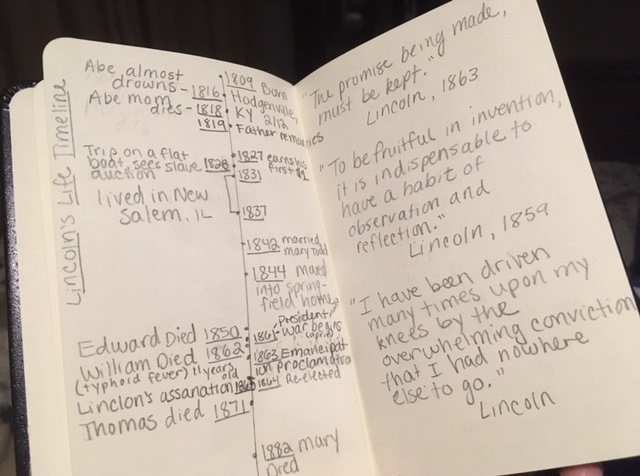 Also new to me was the realization that his second son to die did so while Abe was living in the White House, one year after the Civil War began. I cannot fathom the weight of grief that laid upon Abraham at this time in his life. That said, the number of tragedies that Mary, his wife endured was beyond imaginable. After losing two of her sons, her husband was shot and six years later a third son died. It’s quite honestly beyond my comprehension. Should you ever find yourself in Illinois, I encourage you to take some time getting to know Abe. I think you will find it worth your time. For the rest of you looking to dig a little deeper into the life of Lincoln, I can recommend two wonderful living books to check out from your library or purchase to own. The first, Abe Lincoln Grows Up, is well suited for middle school through adult ages. This is one we plan to read together later this year. The second, Abraham Lincoln by Ingri & Edgar Parin d’Aulaire is a 1940 Caldecott Award winner and for good reason. I LOVE the illustrations in this book but the words are also dripping with beauty. Although it is considered a picture book the length (64 pages) makes it perfect for a multi-sitting read. Tomorrow we head to St. Louis where we plan to stay for a few days before heading East to Kentucky. 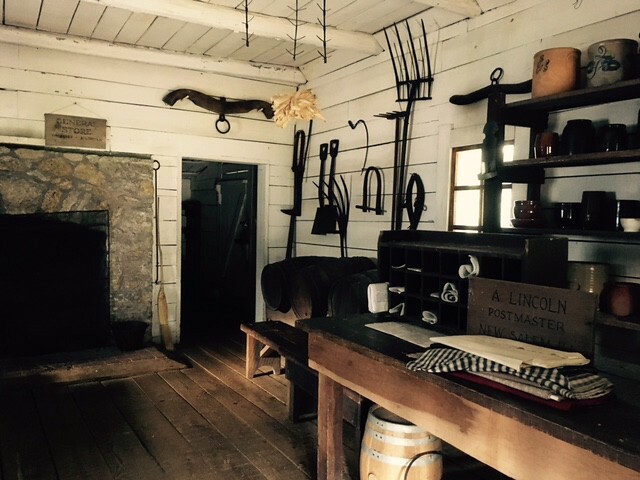 –Lincoln’s New Salem State Historic Site is open 7 days a week 9-5 with free parking and admission (suggested donation of $10 for a family). Plan on 1-3 hours depending on how much time you want to take reading about each house and the history who lived there. They also may have an interpretive costumed worker on site who can explain in more detail and answer questions you may have. -We camped in their RV park for $10/night (no electricity). Water is not at every site but if you stay during the week you might have your pick of spots like we did and can position yourself right next to a water source. They do have a dump station on site. The grounds are quiet and beautiful. Sites with electricity are $20/night (prices are higher on holidays). 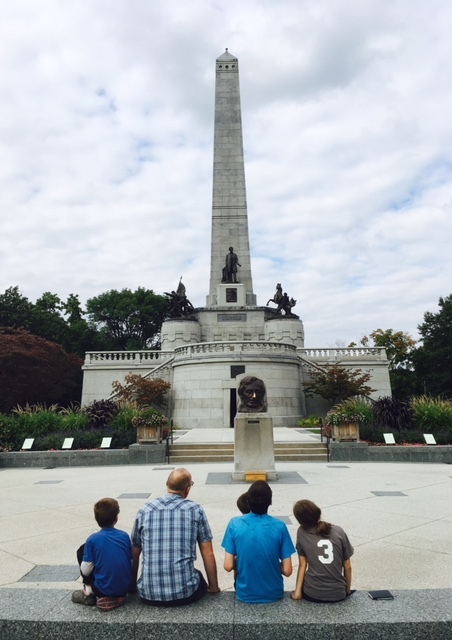 –Lincoln’s tomb Free (Plan on at least 15-30 min to walk around both outside and inside). 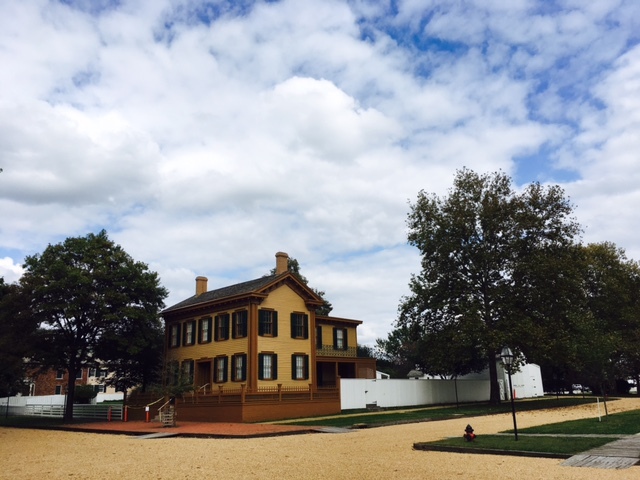 –Lincoln’s home was free to visit/tour. Parking was $2 and hour unless you have a National Park pass in which parking was $1 an hour. Plan for at least 1 hour (maybe more if you wish to have time for completing your Jr. Ranger booklet). –The Lincoln Presidential Museum (Located just down the road from Lincoln’s home) We opted to purchase the annual family pass for $85 which will allow us to use the Time Travelers Passport granting a free or discounted admission to many other places we may visit as part of a reciprocal relationship. We parked in the library parking lot for $0.75/hour. Plan to stay at least 3-4 hours (we stayed about 4.5).